As much as Jonathan Larsen’s unprecedented Pulitzer Prize-winning musical Rent impacted popular culture, it also transformed the lives of the actors that embodied a group of young friends trying to forge a life for themselves in New York’s bohemian East Village. 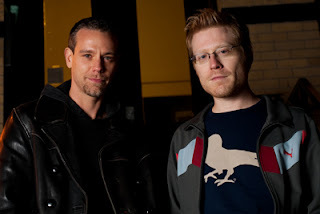 20 years after Rent’s Broadway debut, original cast members Adam Pascal & Anthony Rapp reunite at the Music Center at Strathmore on Friday, April 28, 2017 at 8 PM to commemorate this cultural touchstone and 20 years of friendship. The concert of duets and solos will include originals, reimagined Broadway classics, and favorites from Rent. For more information or to purchase tickets, call (301) 581-5100 or visit www.strathmore.org. Throughout the set, the duo will share stories about their careers, including what it was like working on one of the longest running musicals in Broadway history. Rent has proved a thread throughout their careers that has periodically brought the two back together - prior to the 20th anniversary concert tour, both reprised their Rent roles during the national tour in 2009. Tony-nominated Adam Pascal recently returned to Broadway’s Nederlander Theater, where Rent lived for years, in the new musical Disaster! Since his days playing Roger in Rent, Pascal has starred in Aida, Chicago, and Memphis. He is currently playing Shakespeare in the national tour of Something Rotten! After originating the role of Mark in Rent, Anthony Rapp went on to originate another character in If/Then alongside previous Rent co-star Idina Menzel, which debuted at Washington, DC’s National Theatre. He wrote the book Without You: A Memoir of Love, Loss, and the Musical Rent, about the demands of life in the theater during his mother’s battle with cancer, which he later adapted into a one-man show. It was recently announced that Rapp will star as “astromycologist” Lt. Stamets in Star Trek: Discovery for CBS All Access, the first series developed specifically for this platform and the first Star Trek series since Star Trek: Enterprise (2005.) Stamets is also the first openly gay character conceived for the Star Trek franchise. For additional information or to purchase tickets, please visit www.strathmore.org or call (301) 581-5100.